The hallmark of this 2013 awardee is “selfless willingness” – his own and that which he inspires in others. The 2013 Peter Melendy Distinguished Community Builder Award is presented to Vilas L. “Sid” Morris for extraordinary dedication to this community by volunteer service and by motivating others to participate in and support the Boards, the Councils, the Centers and Societies that are central to the enrichment of the lives of the citizens of Cedar Falls. For over 50 years, Sid has served Cedar Falls and the Cedar Valley with advancing undertakings that contribute to the well-being of the citizens through cultural, educational, and recreational opportunities. As one of his award nominators wrote: “Sid’s contribution . . . is to our greater society. Everyone he interacts with benefits from his experience, professionalism, counsel, skill, leadership, and integrity. . . .It is difficult to quantify how many individuals and organizations have benefited from his devoted service and distinguished leadership. He never turns down a request for assistance or advice, and many turn to him for guidance and wise counsel.” The nominator cited over 28 separate citizen Boards that Sid has served for decades, many of which he chaired, all of which he enabled and ennobled. EDUCATION, BACKGROUND AND PROFESSIONAL SERVICE. Sid grew up in southwest Iowa, with education achievements at Clarinda Junior College, BA in Junior High School Education from (now) UNI, and MA from there as well in Elementary Administration and Supervision. In addition, Sid earned Certification in Special Education Administration, and Certification for Secondary School Administration and Supervision. In 1995, Sid retired from his 40-year career in education having dedicated most of his professional life to educating youth, including those with special needs. A sample of his lengthy assignments includes Bedford and Waterloo Community Schools, Black Hawk County Head Start Program, Area 7 Educational Consultant in Special Services, River Hills, and Visiting Instructor in the UNI Departments of Special Education and School Administration. Sid was drafted into the US Army in 1952 and trained as an artillery fire control specialist at Fort Chafee, Arkansas. He became a combat veteran serving near Pork Chop Hill and Old Baldy with the 31st Field Artillery Company, 17th Infantry Regiment, 7th Infantry Division. After 13 months in Korea, Sid was honorably discharged in 1954. Married for more than 57 years, Sid and his wife, Alvira, have two sons, Jeff and Dan. CEDAR FALLS UTILITIES BOARD OF TRUSTEES. Sid has served on the Cedar Falls Utilities (CFU) Board of Trustees since 1998, initially as a member of the grassroots committee which significantly contributed to the establishment of the CFU’s Municipal Communications Utility. This committee presented a recommendation to the City of Cedar Falls which led to the referendum and the overwhelming support to form a municipal communications utility. Further, Sid advocated on behalf of CFU to local and national legislators ensuring that the voice of public power was heard at the state and national legislative levels. His participation and advocacy contributed greatly to Cedar Falls’ economic growth and our city’s ability to attract quality businesses and industry to our community. CEDAR FALLS GOVERNMENT. Sid’s competencies as a leader of our city were noticed long ago. He was elected to the City Council for a total of 6 years, during which time he was Mayor Pro Tem and served on numerous Council committees. Further, Sid served on the Cedar Falls Planning and Zoning Commission and Cedar Falls Board of Appeals. CEDAR FALLS VETERANS MEMORIAL PARK. 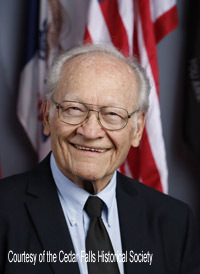 Sid was instrumental in support of the Veterans Memorial Park located at East 14th Street and Waterloo Road, Cedar Falls. This 1-acre property was acquired in 1996 and is dedicated to those who have served their country. The Park pays tribute to all five military services and recognized individuals by engraving their names, branch of service, and service dates on the five brick walkways established for that purpose. This area for quiet reflection and/or public ceremony includes a 50-foot flagpole, replica of the Statue of Liberty originally located in Overman Park, granite work, park benches, and lovely landscaping. Sid was energetic in attracting interest in purchasing recognition bricks for the original park and he is working to expand the site, rejuvenate interest in brick sales and to support the maintenance and upkeep of the Park. CEDAR FALLS COMMUNITY MAIN STREET. Sid served on Community Main Street’s Board. His initiative and fund raising energized the Board’s Main Street Lighting Project. CEDAR FALLS HISTORICAL SOCIETY. The CF Historical Society had the benefit of Sid’s participation in many roles, including serving on the Board for 20 years and chairing it. Sid’s particular passion has been the Ice House Museum, chairing its council through the arduous flood and renovation. He chaired the city’s Sesquicentennial celebration. CEDAR FALLS COMMUNITY CENTER. Sid was on the Community Center’s Fundraising Committee at a crucial point in its development and assisted in achieving financial support and community support for the Center as a part of the Library project. The Community Center continues as a vibrant asset for community seniors. OTHER ENDEAVORS. Sid’s exhaustive service to the community and extended Cedar Valley includes serving on boards of Silos & Smokestacks, Hawkeye Community College Foundation, Goodwill Industries, American Legion, Korean War Tall Corn Chapter, and the Cedar Valley United Way. He has been recognized by these and many other organizations for his service and recognized by the Courier in its 8 Over 80 tribute. A true visionary, Sid believes in the power of philanthropy and leads by example. He has laid the foundation for many individuals to have a long-lasting impact on our community and beyond in the Cedar Valley. Through cultivation and stewardship, he has engaged countless individuals to do something “bigger than themselves.” He has a remarkable way of seeing what needs to be done and then how to approach it through the collaborative networks he develops, building community. In every sense, Sid Morris reflects the Peter Melendy Distinguished Community Builder Award through his outstanding contributions to the City of Cedar Falls through leadership, inspiration in others, selfless dedication of time, energy, knowledge, skills, and support.